Square skirting board is a great choice, if you're looking for a fresh look, due to its plain appearance and sleek edging, enhanced further by the superior quality cutting knives we use, resulting in an extra smooth finish. Our superior grade MDF is far less absorbent, requiring less primer to cover it, saving you that extra time and money. Or why not let us prime your products for you, so they are ready to simply paint with a top coat of your choice. Our moisture-resistant MDF range, is ideal for use anywhere in a building, as it combats damp and moisture for a greater life expectancy. All our MDF boards, can be manufactured for you, in either a 3050mm (10ft) standard length, or an extended 4200mm length, supplied exclusively by us, however please allow 5 to 7 days for delivery with this option. Our hardwood boards are superior quality, and available in a variety of different woods; European Oak, Sapele, Oak, Tulip and Ash, all finished to perfection. Our quality hardwood boards, are only available in the standard 3050mm length, please allow 7 to 14 days for delivery, as our solid wood range take a little longer to manufacture. 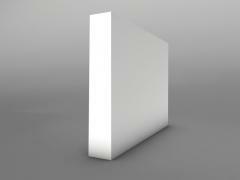 We also supply architrave sets in this design, to fit various door frames. Our standard sets comprise of two lengths; 2 x 2440mm lengths for each side of a door frame, and 1 x 1220mm for the header architrave. However an extended length architrave set is also available, of 4200mm as shown above. Our architrave sets are available in standard MDF, moisture-resistant MDF and hardwood. Our hardwood architrave sets are manufactured in the same woods as discussed above, once again please allow 7 to 14 days delivery on our hardwood architrave sets, as they take slightly longer. We can guarantee, that all our hardwoods are sourced from a sustainable resource. 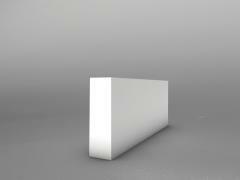 Our square skirting board is a simple design and can be supplied in a 68mm sample, if you require. For only £1.67 it will give you a clear perspective of how the design would look in your rooms. We produce all our product range ourselves, in our UK manufacturing base. Perhaps you're looking for a specific plain or detailed product to match existing boards or architrave in a property. Then please enquire about our bespoke design service, to discuss whether we can fulfill your individual requirements. We have gained a vast knowledge of bespoke elements through previous customer needs and ideas, and are very happy and indeed confident to consider any unique designs you may wish to share with us.